I really like the fact that Secret Recipe Club brings new blogs into life every month, blogs I may or may not have found and fallen in love with. Had it not been for Secret Recipe Club, I may not have met some wonderful blogging friends! Sometimes you get a blog as “your assignment” that you may have seen but never really looked deep into, and then sometimes you get a blog in your e-mail as “your assignment” that you have loved for a while and already know that you’re going to find something amazing to make for the challenge. That was the case this month. 🙂 I was given Christiane’s blog Taking on Magazines. I’ve been in love with this site for a while now. Not only for the recipes, but because of the way Christiane delivers each recipe. She gives what she loved about the recipe, what she didn’t love and what she would do different next time. She gave this recipe rave reviews and she had every right too! It was so good. Amanda from Amanda’s Cookin, has created an amazing Club called The Secret Recipe Club. We have a ton of members and 4 different “Groups”. We get to find new recipes each month and support other bloggers. It’s a great club, that I love. Find out more about it here . Today is Group C’s Reveal Day! 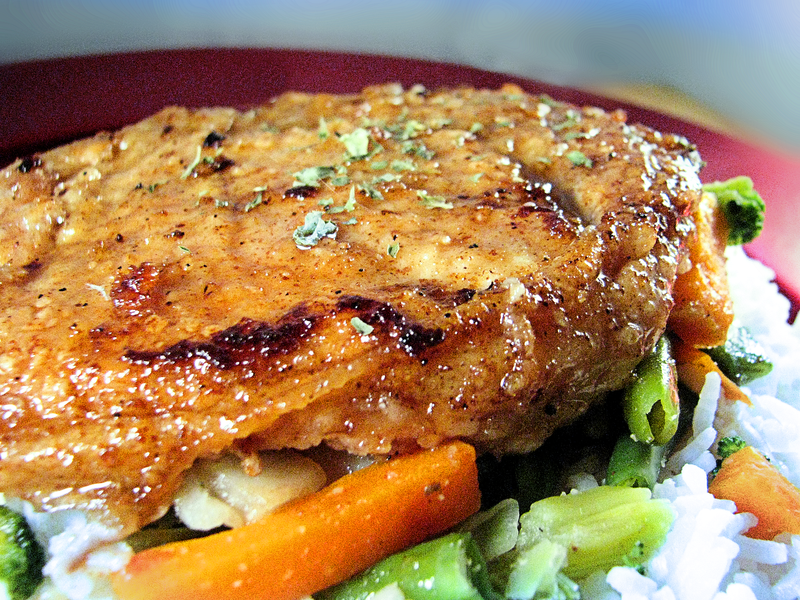 I choose Taking on Magazine’s Pork Chops with Maple-Ginger Pan Sauce. I changed up the amounts of some things and left a few out, but over all I think I stayed to pretty much the same. I also changed some of the directions to the way I made mine. ok.. so maybe I didn’t stay the same, but I tried… I just had to go with some things I had on hand at home. Optional: White Rice and Mixed Vegetables, I plated mine over white rice and mixed vegetables. Rinse the pork chops and pat dry. In a shallow dish, mix the flour and 1 tablespoon of ground ginger. In a separate bowl, mix the maple syrup, rum, and 1 tablespoon of ground ginger. Set Side. Season both sides of the pork chops salt, pepper and garlic salt. Dredge the chops in the flour. Heat a large skillet on medium-high heat. Add 1 tablespoon of butter, and melt. 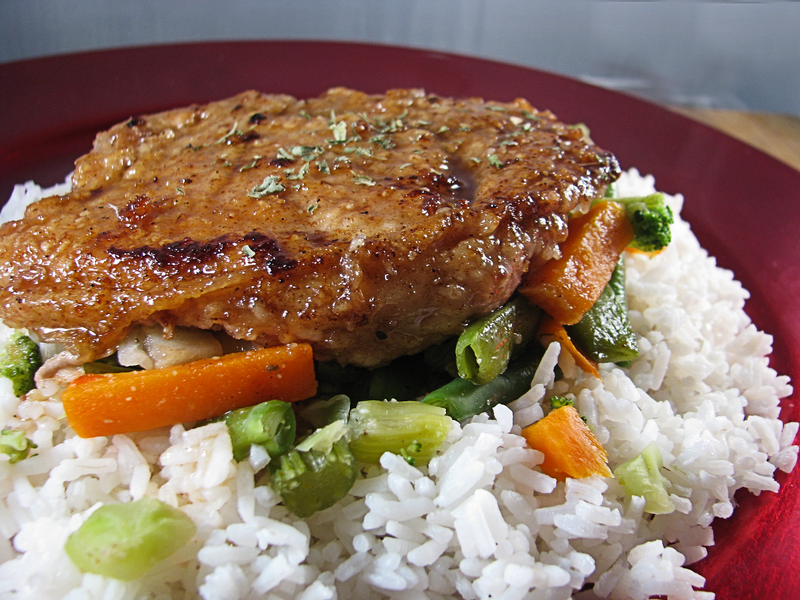 Once the butter is melted and sizzling, place 2 pork chops into the skillet. Cook the first side for about 2 minutes. Move the cooked chops to new clean plate and add the next 2 pork chops. Cook just like before. 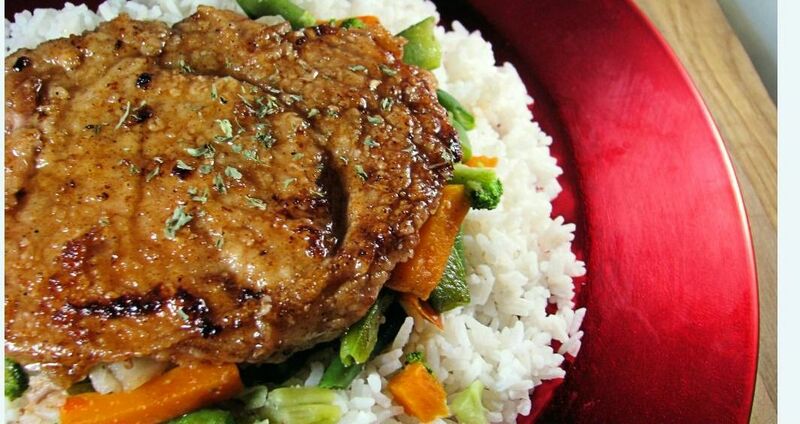 Remove all of the pork chops from the pan once they have been cooked. Once the sauce has thickened just a little, turn the heat off. To finish the dish off, I dunked each pork chop into the maple rum mixture for about 30 seconds, before plating on-top of mixed vegetable and white rice.